The Breville Ice Cream maker may be just the machine you are looking for! It's easy to learn and makes great ice cream and has different options for different desserts. It's sturdy, doesn't break easily, and reliable. It's one of the best ice cream makers you could buy. It's also a beautiful stainless steel that goes perfectly in any kitchen. What Is the Breville BCI600XL Smart Scoop Ice Cream Maker? 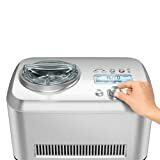 When you have a sudden craving for ice cream, all you need to do is turn it on and allow it to cool, then add the ingredients. With these other choices, there are different setting you can use to make sure you get just the right texture and thickness. It also has a 'keep cool' setting in case you aren't ready for your frozen treats, or if you're waiting for someone to come over and test it out with you. It lets you know the frozen treats are done in a cute, fun way. You can choose between chimes, jingles, or the silent mode. It also comes with recipe books. As we mentioned above, you can choose from Ice Cream, frozen yogurt, gelato, and sherbert. The Breville Ice Cream Maker also has that 'keep cool' setting in case you aren't ready yet.. It only takes up to 50 minutes for the Ice Cream to be done. Another awesome thing is that it has a child lock so that the kiddos don't accidently stop it from making their Ice Cream! It's silent so that it won't interrupt your Tv marathon or study day. It has different settings to let you chose different thicknesses. It also has handles on the side for easy moving. And of course, all of the different settings: the start and pause button, the timer, the pre cool and keep cool buttons, the temperature button, the hardness modes, the sound button, and most importantly, the power button. The Breville Ice Cream Maker has a lot of different fun things to try. Ice cream makers, in general, sell for between a couple of hundred, to a couple of thousand dollars. Price varies on where you buy it from, and it can be purchasedon amazon .The cheapest ones are the used ones, mostly from eBay, and the more expensive ones come from, the more expensive places, like Bed Bath and beyond. We picked out a couple of similar products available on the market to see how they compare. On Amazon, the price is approximately Three hundred and fifty dollars. It is the runner-up for being the most expensive. Reviews state that the Breville was super easy to use and super easy to clean up after. The bowl pops out and makes it easy to clean before next use. It has many different settings which can be hard to learn at first, but once you learn them, they make the process fun and easy. The design quality is fantastic. The bowl comes out for easy cleaning, the ice cream comes out creamy, and all the different parts come out easily and are easy to clean as well. The warranty lasts for only a year which is understandable, but most customers feel uneasy with that short amount of time. Although it only lasts a year, it isn't a huge hassle to go through unlike some of the other options. Stainless steel housing , Voltage: 110/120V 60Hz , Power: 180 watts. 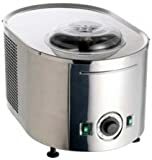 The Whynter ICM-200LS Stainless Steel Ice Cream Maker is a smaller type of ice cream maker. The bowl is a lot smaller than the bowl used for the Breville Ice Cream Maker. It costs less because of its smaller size, and it is easy to find a small place to store it. It has fewer buttons, so it is less of a hassle to figure out. You can do as many batches right after the other because you don't have to pre freeze. It also doesn't require ice. It's easy to use, easy to clean. Just overall easy. On Amazon, the price is approximately Two Hundred and Sixty dollars. This makes it the cheapest Ice cream maker on the list. Fewer buttons to figure out, the bowl comes out making it easy to clean and takes less than three minutes to clean. Reviews say that it is easy to use, easy to clean, and since it is so small, it is easy to find a home for it that isn't out in the open, taking up space on your countertops. On Amazon, you can choose between a three-year warranty and a four-year warranty. It does cost a bit extra though. A three-year warranty is around fifteen dollars, and a four-year warranty is around twenty-four dollars. The Cuisinart ICE-100 Compressor Ice Cream and Gelato Maker can be used to make both ice cream and gelato. It has two paddles so that your ice cream or gelato comes out with just the right texture. The bowl can hold up to one and a half quart of ice cream or gelato. A nice bonus is that while it is mixing, you can lift the lid to add different flavoring to make it unique. It automatically keeps your dessert cool for up to ten minutes after it is finished mixing. Reviews say that it is easy and fast to use. You can make batch after batch, no waiting in between batches. On Amazon, the price is approximately Three Hundred Dollars. This makes it the second cheapest ice cream maker on the list. The bowl comes out for easy cleaning, it isn't super confusing and hard to learn, you can make one batch after the other without having to pre-cool it and wait, and it's always ready to make a batch of your favorite ice cream or gelato. It has a smaller bowl, so it takes more time to make larger servings of ice cream or gelato. According to reviews, getting the warranty is a huge hassle. The Lello 4080 Musso Lussino 1.5 Quart Ice Cream Maker is a bit more expensive than the other options. It weighs forty pounds, so it would have to be on the counter, taking up some space. It takes up to twenty-five minutes to be completely finished making the ice cream. With that quick of a time, it makes the ice cream extremely creamy and less icy than the others. It is super simple to use with just a few easy to figure out buttons. On Amazon, the price is approximately seven hundred and twenty dollars. The most expensive ice cream maker on the list. While the actual process of making the ice cream is super easy, the cleaning after is very difficult. The bowl can't be removed from the machine, making it very hard to clean out the bowl. It's also very heavy, so it would be difficult to move it closer to the sink to clean it. You also have to make sure the bowl is warm when you try to clean it, otherwise the clean water will just freeze. As we stated above, the design is fantastic until you get to the cleaning. The bowl stays inside the machine, making it difficult to clean the bowl. But, other than that, the design works perfectly. It makes amazing ice cream that is very creamy and not icy. The warranty on Amazon for this product lasts up to four years. You can purchase it, adding an extra thirty-three dollars to the bill, but, it could be worth it. The Breville Ice Cream maker seems to be one of the best ones to go for if you are looking for something reasonably priced that works well. Out of all four, the Breville Ice Cream maker is the second most expensive. It has more options, and it creates more desserts than the other three. It comes with an upfront warranty that lasts a year, and it isn't a huge hassle to trade it in if it doesn't work. It has a big bowl, and the bowl comes out to make it easy to clean up. It keeps the dessert of your choosing cold for you until you are ready to eat it. It's practically silent, and it has helpful kid-friendly settings. It doesn't make the ice cream quick, but it makes it creamy and delicious. It has a nice look to it, so even though it's too heavy to move off of the countertop, it still looks nice. 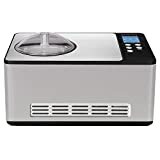 Compared to the others, it has a good sized bowl, it's not too expensive, super easy to clean, the warranty isn't a huge hassle, and it makes creamy ice cream. The cons compared to the others are that the Breville Ice Cream maker costs a bit more than the smaller ones, it takes more time to make the ice cream, it can't make back-to-back batches, more buttons to learn before using, and it can't be stored somewhere out of sight. Out of five stars, this product would have to be rated four stars. It works really well; the machine does its job. It has so many different options and buttons to choose from. You can choose to hear a little jingle when it's finished, and the warranty is good. It makes a good amount of ice cream (or whatever dessert you made), and it is easy to clean up afterward. The Breville Ice Cream maker is the best choice if you want something easy to learn with many options to choose from. Copyright text 2018 by Ice Maker Blog.